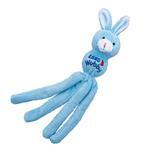 -- Select a Size/Color -- Assorted Colored Wubba Bunny - Out of Stock! Cats will hop into the fun with the KONG Wubba Bunny Cat Toy! Spoil your feline friend with the KONG Wubba Bunny Cat Toy! This toy for cats is specifically designed to appeal to a cat's instinctive desire to stalk and capture prey. The Wubba also rattles and is infused with natural catnip! The tails crackle when your cat contacts them, encouraging continued play. This little bunny will give your pal hours of hunting fun! Two tee's returned because size was two small. I followed your sizing chart but that did not work. I bought one other same size but different mfg.